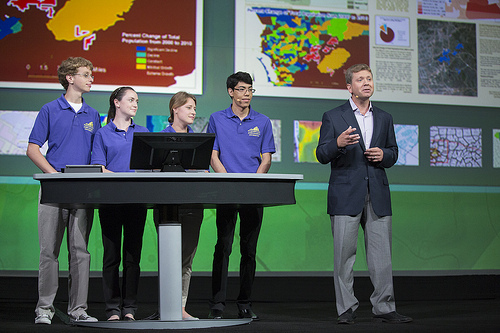 Esri’s Education team is often asked: Does GIS have value for kids? What kinds of things do students, teachers, and administrators do with GIS? Yes, GIS does have huge value for kids as well as adults! Today’s youth are tomorrow’s decision makers and GIS users. “Geo-Literacy“—the ability to use geographic understanding and geographic reasoning to make decisions—is a critical skill for addressing the tough issues affecting global health and community life. It’s also crucial to students’ personal success. Youth today are using GIS in and out of the classroom to look at issues from local to global scale, learning important classroom content, and gaining skills valuable for college and career. Charlie Fitzpatrick. Photograph by Kris Krüg. The watchword for education today is “STEM,” which stands for “science, technology, engineering, and mathematics.” Policy leaders and decision makers alike want youth to expand their STEM knowledge and skills, to improve long-term futures. GIS is STEM, through and through. With GIS, students and teachers handle the same technical issues that professional GIS users face every day, dealing with software, data, analysis, and project management. Some are building data for classrooms elsewhere, solving real-world problems for their communities, or helping professionals in varied fields. Youth with GIS skills are doing community service projects, taking on internships, or even getting jobs helping local organizations tackle real-world issues. Meanwhile, in these challenging economic times, more school administrators are using GIS to make decisions about safety, transportation, or facilities management; every dollar saved in operations is a dollar that doesn’t have to be cut from instruction. Web-based maps allow the public to get relevant, accurate, and timely information easily, 24×7. ArcGIS Online now makes it “one-click easy” for students and educators to begin making maps and learning using unlimited content that spans from global to local. Students can examine rich, dynamic, interactive content, and construct their own custom presentations, while scaffolding skills for their future. Educators can incorporate storehouses of professional content or generate their own to share with students, the community, or the world. Administrators can integrate data to provide better information to the public and facilitate decision-making. A free, quick, powerful, online course has helped hundreds of educators learn why and how to use ArcGIS Online. Educators and administrators can find extensive support at the Esri GIS Education Community website. GIS in action at Washington-Lee High School in Arlington, Virginia. 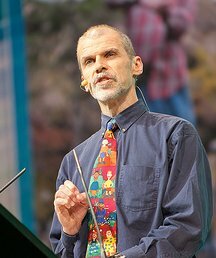 Watch the video from the 2012 Esri User Conference here. GIS professionals can help local schools and clubs by adopting a classroom or group, providing support as they build knowledge of geography and learn GIS. Esri and National Geographic introduced the GeoMentor program in 2009 to foster these relationships. Anyone can be a GeoMentor and support youth, educators, and their community.